So, my setup here works awesome for VR both in macOS and in Win10 via bootcamp. Powers both my HTC Vive and my Oculus Rift SDK2. However, I cannot for the life of me get the eGPU to power any of my LG UltraFine displays ... they must be plugged in directly to the TB3 ports on my MBP to work. I have tried DP to USB-C cables and adapters and nothing seems to work. Any suggestions? Cracking set up and interesting to hear about the issues with the LG display, I have one too and was going to try the same cables you have but had a feeling they wouldn't work... I have a feeling we may have ot wait until Apple releases its own eGPU. Did you encounter error 12 at all? Very nice setup! Judging by the relative scale to the 15" MBP display, these are 21" 4K LG Ultrafine displays? Thank you for sharing the pictures of your Sonnet Breakaway 550. I recognize that PSU! It’s the same as the one in Mantiz Venus. Did you test out any game for Ultrafine Directly connecting from Laptop in comparison to Internal screen? Is there a huge FPS drop down as they would get on 5K display? I did connect HDMI output to a 1080p TV and got 90 - 120 fps using Heaven benchmark in High quality. Was getting 20 - 40 fps using the dGPU. to see if that performance drawback was just on Ultrafine 5k or 4k as well. If that's happing on 4K as well, an eGPU wouldn't speed up anything while using Ultrafine 4k (given current possible connection) anyway. Have you tried any games? on Windows my 360 video stitching software can use egpu, but games use internal 560 card. Or, may be, there is a fix? Update: I replaced my RX580 with a Vega 64 and works fine now. 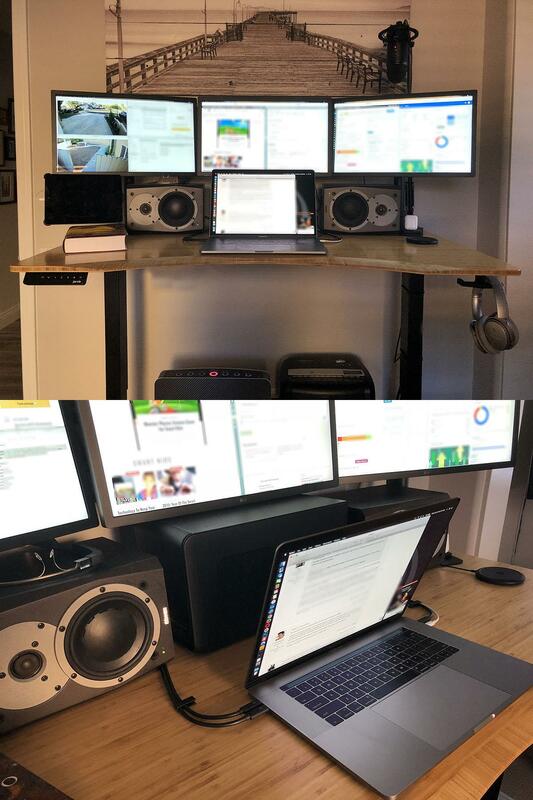 I have a similar setup as yours, but I have some trouble to get a proper screen on my external DELL display. Thanks for some useful inputs!